Choroid plexus is a small organ located inside the nervous system, more precisely in the brain in proximity to the ventricles. 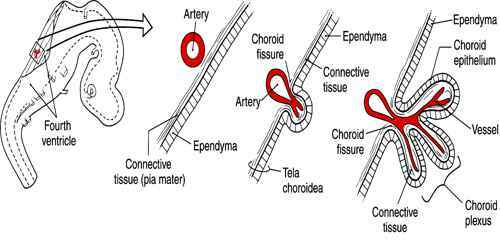 The choroid plexus consists of modified ependymal cells. Choroid plexus are often afflicted with non cancerous tumors that nevertheless have to be surgically removed, particularly to avoid those secreting excessive amounts of cerebrospinal fluid, which could lead to increased pressure on the central nervous system, with risks of cell-death from the compression. Choroid plexus translates from the Latin plexus chorioides, which mirrors Ancient Greek χοριοειδές πλέγμα. The word chorion was used by Galen to refer to the outer membrane enclosing the fetus. Both meanings of the word plexus are given as pleating, or braiding. As often happens language changes and the use of both choroid or chorioid is both accepted. Nomina Anatomica (now Terminologia Anatomica) reflected this dual usage. 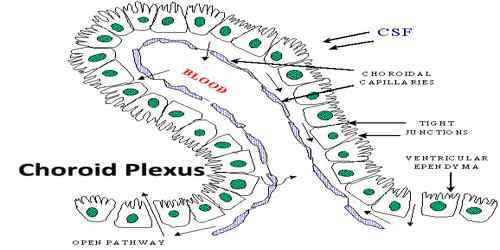 The choroid plexus serves two important functions in the body. It produces cerebrospinal fluid and helps to provide a barrier, which protects the brain and other central nervous system tissue from toxins. Choroid plexus structures are found in certain locations within both lateral ventricles, as well as within the third ventricle and fourth ventricle of the brain. 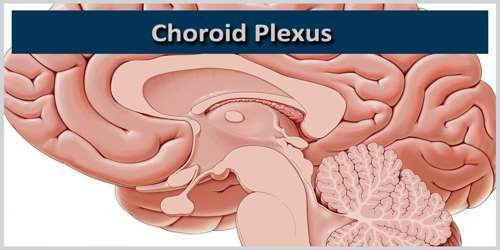 The choroid plexus resides within the meninges; the membrane lining that covers and protects the central nervous system. The meninges are composed of three layers known as the dura mater, arachnoid mater, and pia mater. The choroid plexus can be found in the innermost layer of the meninges, the pia mater. The pia mater membrane contacts and directly covers the cerebral cortex and spinal cord. Choroid plexus is found in the superior part of the inferior horn of the lateral ventricle. It follows up along this boundary, continuous with the inferior of the body of the lateral ventricles. It passes into the interventricular foramen, and is present at the top of the third ventricle.There is also choroid plexus in the fourth ventricle, in the section closest to the bottom half of the cerebellum. The villous structure comprises of multiple capillaries that are interspersed by choroid epithelial cells. Cerebral fluid bathes the ependymal cells in order to facilitate active transportation of few vital substances. Overall, there are four such vascular portions in the brain and each is composed of a sheet of cuboidal epithelial cells encircling the central capillaries and connective tissues. The ependymal layer of cells borders the ventricles along with the epithelial cells. Since these membranous tissues are adhesive in nature, the layer acts as a barrier to a large number of unessential molecules. The nerve complex undergoes folding to form finger-like processes and inserts the ventricles. The hair-like projections are instrumental for increasing the surface area of the plexus. Choroid plexus ependymal cells are vital for the production of cerebrospinal fluid. Ependyma tissue surrounds the capillaries of the choroid plexus separating them from the cerebral ventricles. Ependymal cells filter water and other substances from capillary blood and transport them across the ependymal layer into the brain ventricles. This clear fluid is the cerebrospinal fluid that fills the cavities of the cerebral ventricles, the central canal of the spinal cord, and the subarachnoid space of the meninges. The choroid plexus along with the arachnoid membrane of the meninges also form a barrier between the blood and the cerebrospinal fluid. This barrier is called the blood–cerebrospinal fluid barrier and serves to prevent harmful substances in the blood from entering the cerebrospinal fluid and causing damage to central nervous system structures.